As you know if you follow my Instagram, last Sunday was bid day at my school! I was so excited to receive my bid from Tri Delta- my top sorority since the first day of school. I wanted to share with you all my recruitment experience and hopefully give you some insight into how recruitment works. I am planning on doing a recruitment advice post before the fall 2018 semester starts, as most freshmen rushed in the fall of 2017 or are rushing now. At my college, we have 7 sororities: Alpha Delta Pi, Chi Omega, Delta Delta Delta, Delta Gamma, Kappa Delta, Kappa Kappa Gamma, and Zeta Tau Alpha. About 50-60% of girls go greek, so Greek life is definitely a big part of campus life but not the "only" way to be involved. 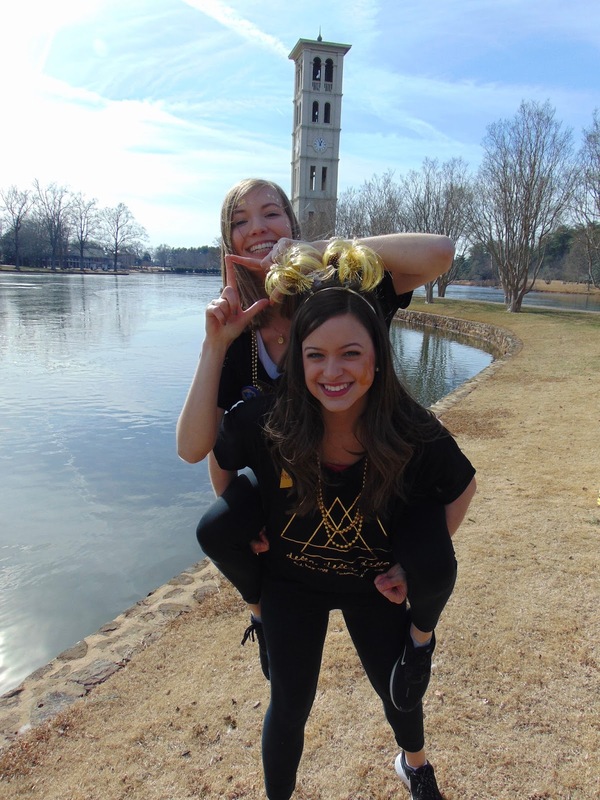 I love Greek life at Furman because it is more than just a social scene. Each sorority is incredibly involved and passionate about their philanthropy- both a local and national philanthropy. This is apparent in the rounds during recruitment, as the girls are thrilled to tell you about their experience with their philanthropy as well as why they love it so much. We have delayed recruitment at Furman, meaning rush starts before the spring semester. At first I hated that rush didn't start until the next semester, but I am honestly so thankful that I was able to find my place and friends at school before joining a sorority. I befriended so many sorority women in several different sororities, something that probably wouldn't have happened if rush was during the fall semester. Delayed recruitment allows you to see each sorority's place on campus. I was able to get a feel for each sorority without relying on the opinions of someone else. I was also able to form connections with girls in the sorority I am in now, helping to make my decision process much easier during recruitment. Now onto actual recruitment. We have 3 rounds- Open House/Philanthropy, Sisterhood, and Preference Tea. If you want to see what I wore during each round (and some advice for outfits to wear during spring aka winter rush, click here). We attended all 7 sororities during Open House/Philanthropy, attended a max of 5 on Sisterhood, and a max of 2 on Pref. Of course some girls attended 3-4 during Sisterhood and only 1 on Pref, but it all depends on who you drop and who drops you. I attended the max on each day. During this round, I thoroughly enjoyed going to each and every sorority. I was nervous before the very first party, as the sorority women are pounding on the doors before the PNM's go into the rooms. However, once I was in the rooms I was set at ease. It's nerve-wracking to meet so many people at once, but it can be fun as well. I loved meeting new people. Even if you don't want to join a sorority, I still recommend going through rush just to meet new people- it's seriously such a good way to do so! I went in with Tri Delta at the top of my list, and it remained at the top of my list throughout. This round focused on getting to know the sorority as a whole and what they do for their philanthropy. The conversations are more surface level, such as where are you from, what's your major, etc. It is mostly you trying to show yourself to the sororities. These rounds are the shortest, and you will most likely talk to the most girls during this round. I was surprised though how the other sororities changed on my list throughout each day. I was dropped by some that I was surprised about, but I also didn't expect to love other sororities as much as I did. Trust your Pi Chi's (sorority women who disaffiliate to help you out during rush) when they say that reputations of sororities shouldn't matter while going through rush. I was genuinely surprised by how much I loved each sorority. You really have to go in to this process with a completely open mind. I was super nervous to open my schedule for this round. Tri Delta was still at the top of my list, so I was hoping to see it on the schedule the next day. Once I got my schedule, I was thrilled to see my top! Sisterhood round focuses more on the relationships the sisters have with one another, aka sisterhood. The women will ask you what you want in a sorority, what your values are, etc. I asked more questions this round, such as what the sisters' favorite memory was, why they chose the sorority. etc. Once again you are showing yourself to this sorority, but the sorority women are also trying to show what being in that sorority is about. Because you are back this day, the women see something in you that could potentially benefit the sorority. So be confidant- they might want you in their sorority! I noticed that a lot of the sorority women were surprised by the amount of questions I asked during this round, but I honestly think that you need to ask questions about the sorority so you can get a feel for it. I felt so at home at Tri Delta during this round, so much to the point where I started crying after the party! This is the most formal, and emotional round, of recruitment. I got asked back to my top 2 sororities. During this round, one girl usually "prefs" you. This girl is usually someone who talked to you during previous rounds, or someone who knew you before recruitment. For both sororities, the girls I talked to were friends I was close to during the previous semester. During this round, the sorority is showing itself to you. Because you are back at pref tea, they see something in you that they want in their sorority. So be at ease- you will most likely find your home in either of these sororities! The women are convincing you to place your vote for this sorority, so they will ask you how you are feeling about recruitment, any reservations you may have, and any questions you have about the sorority. They will go through some rituals during this ceremony, so they are essentially inviting you to their sisterhood for this brief amount of time. This is the longest round, about an hour, so the women will sing, give speeches, etc. I cried during Pref- something I was not expecting before going through recruitment. Crying is not a necessity, and just because you cry in one sorority and not the other doesn't mean you should choose the one you cry in over the other. The best way I can tell you to decide your sorority to "pref" is to choose it based on how you feel in the room during pref. Does it feel right? Do you feel at home? Look around the room- these women could be your future sisters. I made sure to look around the room in both teas. I loved going to both, but I knew from the beginning of recruitment where I wanted to be. But I was so thankful to see another sorority's pref tea, as I knew so many incredible women in that sorority. Aka the most exciting day ever!! I was so nervous this morning, but I just knew that I would end up where I wanted and was supposed to be. I opened my bid card and saw Delta Delta Delta- I screamed! I ran up to the Tri Delt bid day room and ran into the arms of my friends and now sisters. I enjoyed seeing each new sister run through the room. It was pure happiness seeing the day unfold. I am firm believer that everyone ends up where they are supposed to be- so bid day is that day where the stress and emotions of recruitment starts to fade. 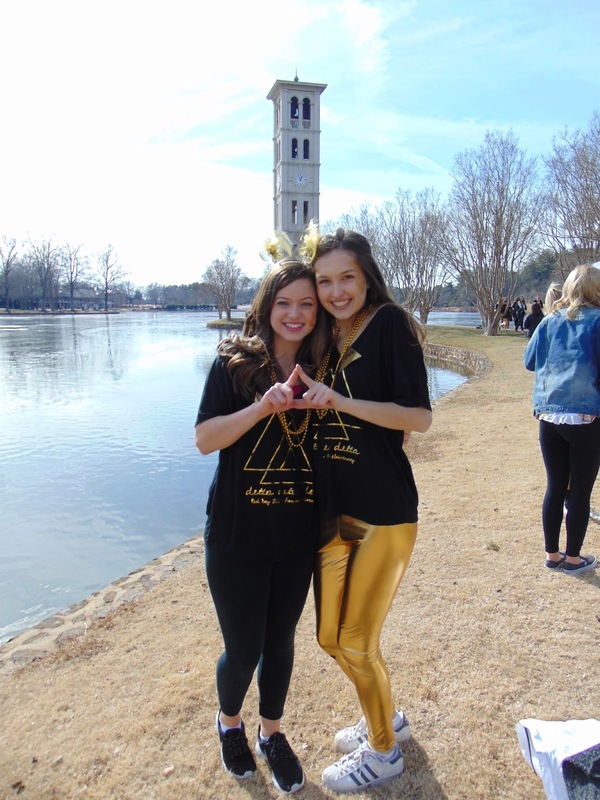 Tri Delta's theme was "we struck gold! ", and I changed into my bid day shirt and took so many pictures. I am so excited for this semester and all the new memories I will make in Tri Delta. I hope you all enjoyed this post, and I hope it gave you some insight into the recruitment process as a PNM (potential new member). I am obviously no expert, but maybe my words can help you in your process. I know I am lucky in the sense that I got my top sorority, but everything does work out for a reason- even if it seems like you have been dropped by the "perfect" sorority for you or none of your friends end up in your sorority. Trust your heart, and don't be persuaded too much by others. This is your journey- and it will work out as along as you stay true to yourself. Good luck! Go Greek Life! Ah hey!! So glad you enjoyed the post- I'm super excited to share my love for Tri Delta throughout my college experience!